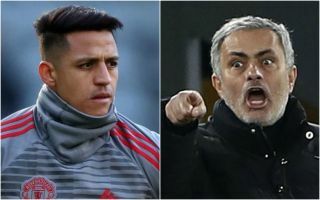 Manchester United manager Jose Mourinho has sent a not-so-subtle warning to under-performing star player Alexis Sanchez. The Chile international has been a big disappointment since his big transfer from rivals Arsenal back in January, but will start again in the Premier League this weekend against Wolves. Some fans are not at all happy about this, but Mourinho has attempted to defend the decision due to Anthony Martial playing 90 minutes while Sanchez was rested against Young Boys in midweek. Despite that, the Red Devils boss did also have a word of warning for Sanchez when asked if the 29-year-old needed to step up his performances after a poor start. ‘Every player has another level to step up,’ said Mourinho, cryptically. This seems a pretty clear message to the former Gunners forward that he could be doing much more than he has so far this season. United have recovered some form recently after a couple of bad results early on this season, but will need players like Sanchez firing if they are to truly mount a challenge for the title this term.